The Bont Vaypor cycling shoes aren’t just stiff and light, they’re different from almost everything else on the market, and in ways that are actually worth talking about. Before you ask, yeah. They’re stiff. …and light. They’re crazy stiff. …and light. Like, if bricks were made out of clouds, stiff. …and light. Let’s talk about something else for a change. This all starts with the way Bont puts these shoes together. Visualize a carbon fiber hole that you drop your foot into. Seriously, think about stepping into a foot-shaped hole an inch or so deep. Cover it with some leather(ish) type stuff to keep your foot from escaping add a couple of straps, and you’re there. These things are all about that carbon fiber hole, which Bont uses to replace the sole you’re used to seeing in a normal shoe. The hole/sole isn’t just underneath your foot, it wraps around your foot, and the leather(ish) upper is glued on to it… but your foot doesn’t get held in place by leather(ish) along it’s circumference, it’s in a carbon fiber hole! That’s pretty different, and it has it’s pluses, and it’s minus-es. These things are – you guessed it – light and stiff. They’re off the charts stiff. The walls of the hole your foot is in serve to stiffen the shoe as a whole (hah!) without the need for much material, relative to a standard shoe design. This also means the soles can be made very thin. Low stack height – or distance between pedal & foot – is the result, and that’s a groovy thing. Lateral stability is also (potentially! More on this later…) a groovy thing, and nothing I’ve ever worn comes close to the Bont design in this regard. Your foot is in this hole, right? The sides of the hole come part-way up the sides of your foot. Slap some leather(ish) on top of that. Now try to rock your foot from side to side inside the hole. It simply ain’t gonna’ happen. BANG. Lateral stability. More than you’ve ever experienced in a cycling shoe. More positives? Once you heat-mold these things – if you’ve got the right size – that hole your foot is in feels like it was custom-molded for your foot. 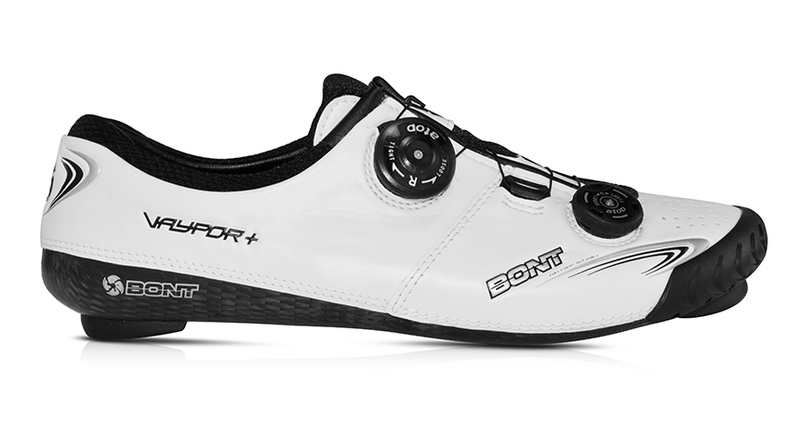 Heck, for the right price Bont will actually custom-mold a pair for you. I had a too-tight rain bootie press the release button on one of my shoes in a race, and sprinted – full gas – with a completely un-strapped shoe. It was barely noticeable. Pretty cool. On a super personal level, my favorite attribute of the Vaypor? These things have really deep ankle cutouts, and a generously sized entrance to the hole. I have GIANT malleoli, and this is flat-out the only cycling shoe I have ever been able to wear without modification. Got cankles? This is the shoe for you. Your foot is in a hole. Sure, it’s a heat-moldable hole, but it’s a hole. Try stuffing your foot into a too-small hole some time. Ouch. You need to buy these things in the correct size, and odds are that size is bigger than you’re currently using, or think you need. Vaypors absolutely do not stretch out or break in. You can (and probably should…) heat mold them, but that’s mostly useful for shrinking them down to fit more snugly. If your feet don’t feel comfy in these right off the bat, things aren’t going to improve with time and use. Size them so you’ve got some wiggle-room, and then shrink ‘em down a bit. Remember that lateral stability thing we were discussing a while back? There’s a downside to this. Your foot is in a hole. It doesn’t move from side to side in that hole, it’s stable. Crazy stable. The angle your leg enters this shoe needs to be the angle your foot engages the pedal with, or you’re going to have problems. With a normal shoe you’ve (literally) got wiggle room. You step on the pedal, you don’t quite engage perfectly, you cant your foot a couple of degrees inward to get things aligned, and off you go. With every pedal stroke, your lateral/medial foot angle varies a little bit, and you never even notice it. With the Vaypors, you’re probably going to notice it. You aren’t standing on top of a sole in a floppy leather(ish) sack, you’re standing in a hole. You might just need to use some of those plastic shoe wedges to make sure that things line up correctly. I did. Once I got things sorted, though, this wasn’t a minus anymore, and now I have a hard time wearing anything else. My cankles decided they liked living in a hole. Ed. Note: Matthew Hill is a Social Media and Marketing consultant, bike racer, and Cycling Coach, a Cyclocross Specialist with CrossSports.net. Mat wrote this article for us after I kept asking what was going on with his Bont shoes.